OUR NEWEST ADDITION TO OUR NYLON RADIO STRAP SETS! The strap is a 2 piece strap that adjusts like a traditional leather radio strap! You have three sizes to choose from: Short (under 5'8" tall), Regular (up to 6'1" tall), or XL (over 6'1" tall or if you are a "big and tall" body type). Total height of holder: 7"
Pocket depth (front to back): 1 3/4"
The radio holder also has a strap that secures the radio from the top to keep it from shifting upward during vigorous motion. Metal rings are secured to the holder for attachment to the radio strap and is a lightweight, streamlined design. The hardware on this radio holder is the same hardware you will find on our leather radio holder. 3 Very lightweight yet exceptionally durable! The short length strap is adjustable for persons up to 5'8" tall. The standard length strap is adjustable for persons up to 6'1" tall. The XL strap is designed for persons over 6'1", or if you are a "big and tall" body type. The strap also features TWO mic loops to hold both your radio mic and cell phone, pager, or whatever accessory you need to carry hands free! 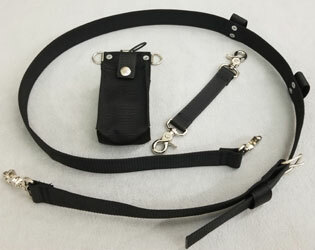 The anti-sway strap has a trigger snap hook on each end and attaches to your belt loop and radio holder to keep your radio from swinging forward when bending over. Ultra durable bartacking keeps the trigger snaps secure.